I have a little yellow note book where I have been keeping track of some of the things we want to do this summer. Today I got the crazy idea that it would be fun to teach the kids to sew. Let me stop right here and mention that I really don't know how to sew. I can thread a machine with the best of them and have a basic straight stitch, so doesn't that qualify me t teach my kids to sew? In all honestly, I figure the best way to learn is to get my kids interested. 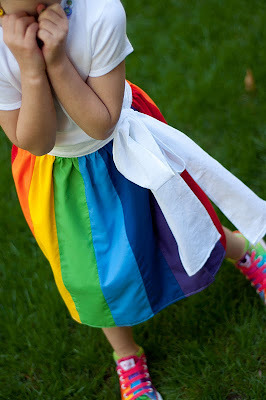 So I went looking for fun things to sew and found this cute rainbow wrap skirt from Aesthetic Nest. I am not sure we will tackle a skirt, but if we were going to this one doesn't look impossible. And it is cute enough to keep us excited. Worse case scenario I have an excuse to buy a rainbow of fabric that will be fun to look at. And then I can take it over to Jennie's house and bribe her with Mt. 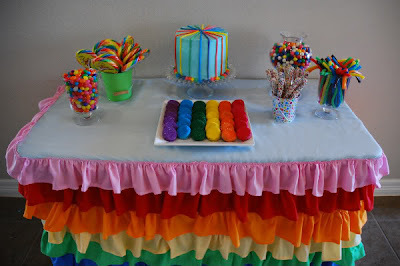 Dew to sew a rainbow skirt. Or just find where she has this fabulous tablecloth hidden and then swap it out for the pile of fabric and hope she never notices. If you have a little girl that will love this as much as mine will, you can see the full tutorial HERE. So adorable! I love this idea. once I get everyone off to school! Second, my nine year old is dying for me to teach him how to sew. He wants to make a blanket for the new baby that's coming in October - cute, huh? Anyways, I found this site that is wonderful for teaching kids step by step how to sew. I was worried I'd leave something out or not teach him something that I just do out of habit, etc. Maybe the site can help you, too!